October 2, 2009, 8-10 PM. To celebrate the start of the event DUO members and their friends around the world will light a candle on October 2, 2009 during their local time of 8-10 PM. The Candlelight Wave will begin in New Zealand and end in Hawaii 24 hours later. Everyone lighting a candle or spotting the Wave, as it slowly sweeps around the world, is invited to post a short message of peace. Each member will spend their 2 hours any way they wish—alone, with family, with friends. I plan on entertaining a few friends and discussing ways that we can make a difference toward world peace. 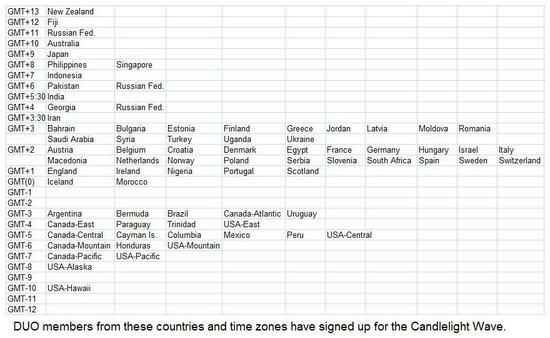 Members from 64 countries have signed up so far. Invite your friends from other countries, as well as your own, to participate. If you would like to participate, please post a message here indicating the country and region where you will light your candle. Note: Locations are country or city accurate only--not street accurate. We are now listed under World March For Peace and Nonviolence. The announcement is listed under Virginia. We now have an international listing! Thank you Gary. You have worked so hard on this! The maps look wonderful and I love the list of all the participants. The listings you have gotten are also great. I can't wait. I appreciate you; thanks for all you have done! Check out this article on our Candlelight Wave and our group. Carlisle (UK) will be doing our bit with Dusty Clogs for Peace where school kids runs laps to add up to the distance across Cumbria of the March...and plenty of candles too!!! We'll light up our candles in Switzerland and talk about it on our website! The day is almost here! I am writing an article about it to send to several newspapers. Maybe others will see the importance of working towards peace! Has the word got out to the news? I have written to Care2 asking for advice as to how to best spread the word within Care2. No response yet. So far I have sent out hundreds of candle images to our members, as well as thousands of invitations to join our group which also contained info about the Candlelight Wave. Other than that….. Certainly some of our other members have promoted the event. Please tell us about it. The Wave is coming soon! Please help us spread the word. Any ideas? Only a few days until the World March and our Candlelight Wave. Please tell your friends about these important events! Spread the word! 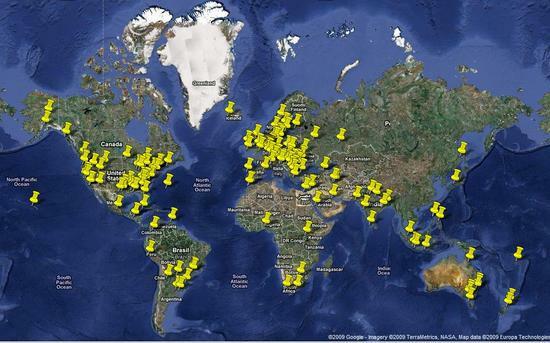 We now have members from 66 countries participating! I will have candle in hand and peace of mind here in the USA in Miami Florida. A 25-hour candle when the Wave starts at 8:00 PM in New Zealand (3:00 AM USA-East). This candle will go out at 10 PM Hawaii time. A 2-hour candle at 8 PM USA-East as the Wave reaches USA. If everyone, who has signed up, lights their candles, the Wave will be continuous for 25 hours except for a 1-hour gap in GMT-2. If some folks in GMT(0) (Iceland, Morocco) could extend their candles one hour and some folks in GMT-3 (Argentina, Bermuda, Canada-Atlantic, Uruguay) start one hour early, then the gap will be closed. See the chart below. In any case at least one 25-hour candle will be glowing during the GMT-2 gap. When you light your candle at 8 PM on Friday, look to the east. 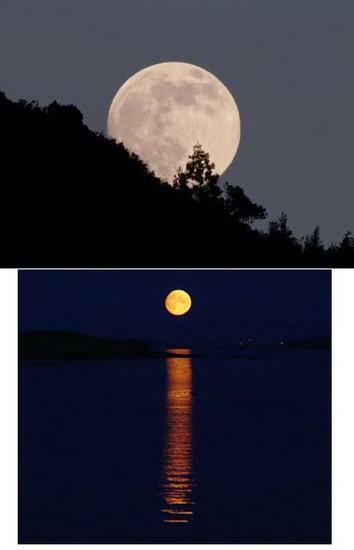 The near-full moon will accompany the Candlelight Wave around the world. The World March activities begin in Wellington, New Zealand. Note in particular the last event of the day. Speeches, music etc at the Gandhi statue in front of Wellington Railway Station. Co-hosted by the Indian High Commission in commemoration of the birthday of Mahatma Gandhi and the United Nations International Day for Non-violence. World Peace March opens the Wellington Peace Heritage Walk and starts walking it. The route goes from the Gandhi statue past Pou Whenua (Wai-titi landing markers) to parliament grounds to visit the Women’s Suffrage garden and Nagasaki figure, then to the St Andrews-on-the-Terrace. A concert of peace songs celebrating UN International Day of Nonviolence. Peace Heritage Walk continue to the Botanic Gardens to visit the Peacemaker sculpture, Peace Garden, Nagasaki Tree, Hiroshima Tree and Kauri peace tree, then to the Wellington Museum of City and Sea to visit the Wellington Nuclear Weapon Free Zone exhibition and ending at the waterfront at the monument for child refugees from the second world war. A ceremony to commemorate the nonviolent struggle of the Parihaka people for justice. In the 19th century Parihaka people were imprisoned in Wellington and Dunedin and forced into slave labour. *Due to schedule conflicts the World March folks probably did not include this activity. Our candle will be burning brigthly at 8.00pm tonight here in the Dandenongs, Australia. Thank you Gary for all your efforts here and my best wishes go out to all those who participate in this momentous event. I wish everybody peace and tranquility. The Candlelight Wave will begin in New Zealand in 6 hours! Candlelight Wave will begin in New Zealand in 5 hours! Candlelight Wave will begin in New Zealand in 4 hours! Candlelight Wave will begin in New Zealand in 3 hours! Candlelight Wave will begin in New Zealand in 2 hours! Candlelight Wave will begin in New Zealand in 1 hour! The Candlelight Wave for World Peace begins! It is 8 PM in Pakistan. The Candlelight Wave is entering a region of the world where many peace candles are needed and where we need to focus our peace vibrations. It was too dark so the above Video Gif is not clear but I guess you guys will like it. Here are my candles for peace, love, hope, tolerance and unity ! Candle Light Wave for World Peace! The candle light wave has just passed through California. Peace, Love and Light to ALL!